The Jade Ornate Traditional Nightstand with Three Drawers by Lifestyle at Royal Furniture in the Memphis, Nashville, Jackson, Birmingham area. Product availability may vary. Contact us for the most current availability on this product. Case Detail Intricately carved acanthus leaf mouldings and convex pilasters. Ornate bracket feet. Elegance and tradition that spans the centuries, the 4258 collection is a decadent jewel for lovers of all things classic. 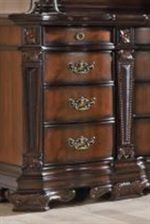 This collection boasts a rich, two-tone wood finish on cherry veneers, the perfect background for the ornate, traditional carvings featured on the bed and storage case pieces. 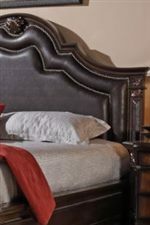 Setting off the warm cherry finish are gold-colored bail pull drawer handles and a bed centerpiece with dark brown, faux leather upholstery covering the headboard. Old themes can get new life in your home with the European inspired elegance of this beautiful bedroom group. The Jade collection is a great option if you are looking for Traditional furniture in the Memphis, Nashville, Jackson, Birmingham area. 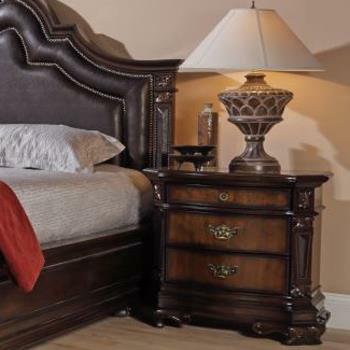 Browse other items in the Jade collection from Royal Furniture in the Memphis, Nashville, Jackson, Birmingham area.